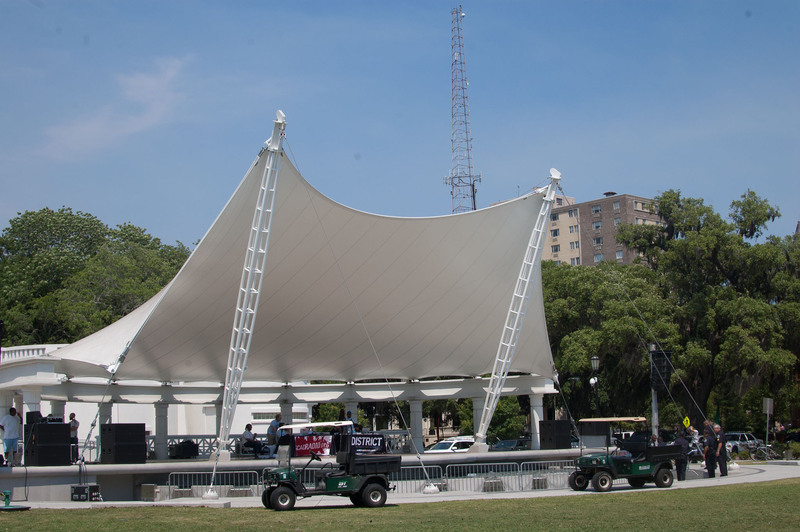 I know some of my City Talk readers got tired of me pointing out the incredible — and easily foreseen and avoidable — inadequacies with the “bandshell” in Forsyth Park after it opened in 2010. But there are lessons to be learned from the process and the resulting mess. And there was a great example of the inadequacy of the project just last week during SCAD’s Sidewalk Arts Festival. The renovation of the old fort and the creation of a “bandshell” had multiple components. I’m going to quit using the word “bandshell” from here on because it’s not a bandshell, which is a rather specific architectural term. 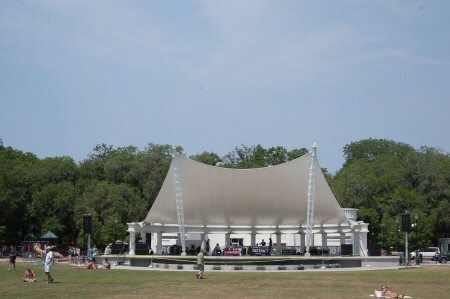 I love the sweep and beauty of the stage we ended up with, but it’s not a bandshell, like what Chatham County voters had in mind when they approved the SPLOST project way back in the 90s (after the County government failed to get one built, they eventually transferred the project and the money to the city). Take a look at these pics at what happened last weekend. From the first, it’s been called an “interactive play fountain” but the playing is only supposed to happen in the jets that shoot out from the base. As happens routinely, those jets were turned off. Kids come to the park expecting to play in the water. Just as soon as one kid gets in, that’s it. Why were the spray fountains off? I’m not sure on this one, but it looked like it might have been because SCAD Radio, which was DJing the event, had some equipment on the lower level near those spray fountains. So on one of the hottest and busiest days of 2012 so far, the spray fountain in Forsyth Park was off. Then local police officers — working security on SCAD’s dime I assume — cleared the fountain and put up ugly caution tape. And then they came back later and put up those ugly metal gates. And this is the focal point for the center of Forsyth. Of course, this is only part of the problem with the design, which obviously tried too hard to please to too many people and meet too many contradictory expectations. The sweeping cover for the stage is gorgeous I think, but it does nothing to help the sound, which local engineers have sometimes struggled with. In response to concerns of neighbors (there’s hardly anyone who can see that stage from their homes, btw) the stage is about 3′ above grade, which is simply too low to work well for major concerts — or even for a lot of minor events. It’s amazing what a difference of 2 or 3 feet would make in terms of visibility and sightlines from all across that field. And then there’s the problem of a stage having a big fountain in front of it, which is routinely gated off entirely during events — again with those horrid metal gates. So at the occasional big rock show, even front row guests are left feeling like the band is a long way away. Several performers have remarked on the strangeness of that too. There are some clear design lessons here — or maybe just one: if you’re going to design something, make sure it performs its primary purpose as well as possible. Move the play fountain to the western field. There’s no reason it need be attached to the base of the stage. Fill in the area now occupied by the fountain with a downward slope so that listeners can get up close to performers. Explore options for raising the center portion of the stage 2′ to 3′ so that people far into the park can actually see what’s going on. There are other issues with the rest of the renovation. The only public bathrooms are inside the fort, so those are closed occasionally when they should be open. For a very small amount of additional money, the rooftop of the fort could have been set up as an event/dining space. There weren’t any culprits here — just too many people trying to accomplish too many goals and please too many people. The result is a Godawful mess — one that looks nice from a distance but doesn’t perform any of its intended functions well.